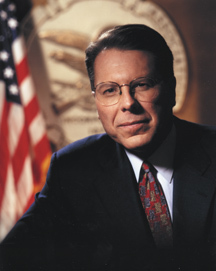 AKA Wayne R. LaPierre, Jr.
Wayne LaPierre is a long-time gun rights advocate and, since 1991, spokesman for the National Rifle Association (NRA). In a 2008 fund-raising letter, he wrote of then-Presidential candidate Barack Obama, "never in NRA's history have we faced a presidential candidate — and hundreds of candidates running for other offices — with such a deep-rooted hatred of firearm freedoms." The letter included a list of Obama's purported ten-point plan to gut the Second Amendment, including "ban use of firearms for home defense", "ban the manufacture, sale, and possession of handguns", "close down 90% of the gun shops in America", etc. Virtually everything on the list was and remains at odds with Obama's campaign positions and political record. When Obama won the 2008 election, LaPierre predicted that within his first year in office President Obama would try to ban the sale of guns. The Obama administration made no such proposal, and pursued none of the frightful items that LaPierre insists comprise the President's anti-gun agenda. Instead, the Obama White House earned an "abject failure" rating from the Brady Center to Prevent Gun Violence, and President Obama signed legislation permitting guns to be brought into national parks, brought on board trains as checked baggage, etc. In 2011, LaPierre refused an invitation to meet with Obama administration officials, stating that the President, as well as Secretary of State Hillary Clinton and Attorney General Eric H. Holder, Jr., are "people that have spent a lifetime trying to destroy the Second Amendment in the United States." Later that year, LaPierre explained that the Obama administration's continued disinterest in gun control is "all part of a massive Obama conspiracy to deceive voters and destroy the Second Amendment in our country." In December 2012, a lunatic named Adam Lanza shot and killed 26 people, including 20 children, at a grade school in Newtown, Connecticut. In response, President Obama actually did, for the first time, call for "meaningful action" to prevent such violence from happening again, leading to legislation that would have required background checks on gun buyers at gun shows. Obama has reiterated this call in the days following most major mass shootings since then, but the President has taken no action beyond those statements. A CNN/Opinion Research poll showed that 94% of Americans supported that proposal, but any legislation along such lines is adamantly opposed by LaPierre and the NRA, and quickly defeated in Congress. "We will never surrender our guns, never," LaPierre said in a speech at an NRA convention a few weeks later. "Our feet are planted firmly in the foundation of freedom, unswayed by the winds of political and media insanity. To the political and media elites who scorn us, we say let them be damned."